What is Free Intelligent Conversation? 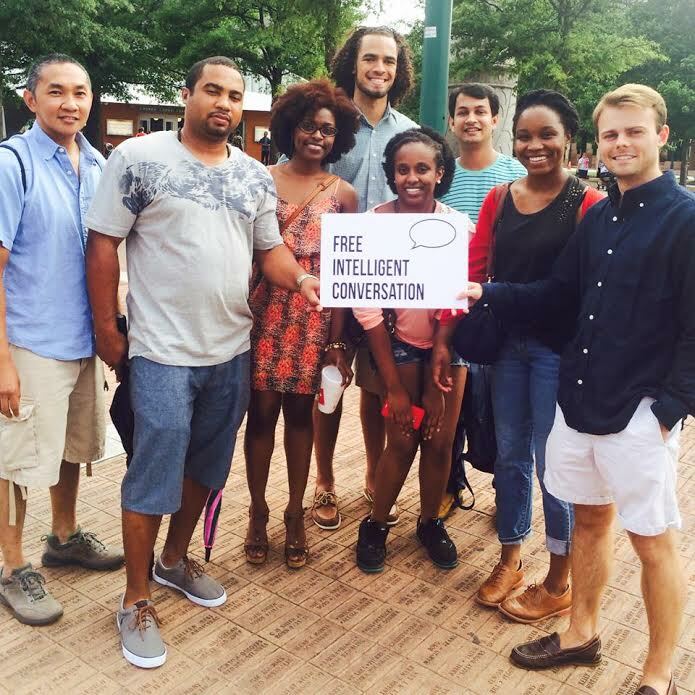 Free Intelligent Conversation (FreeIC) is a non-profit organization that facilitates engaging conversations between strangers in public places. OK, How Do you start these Conversations? 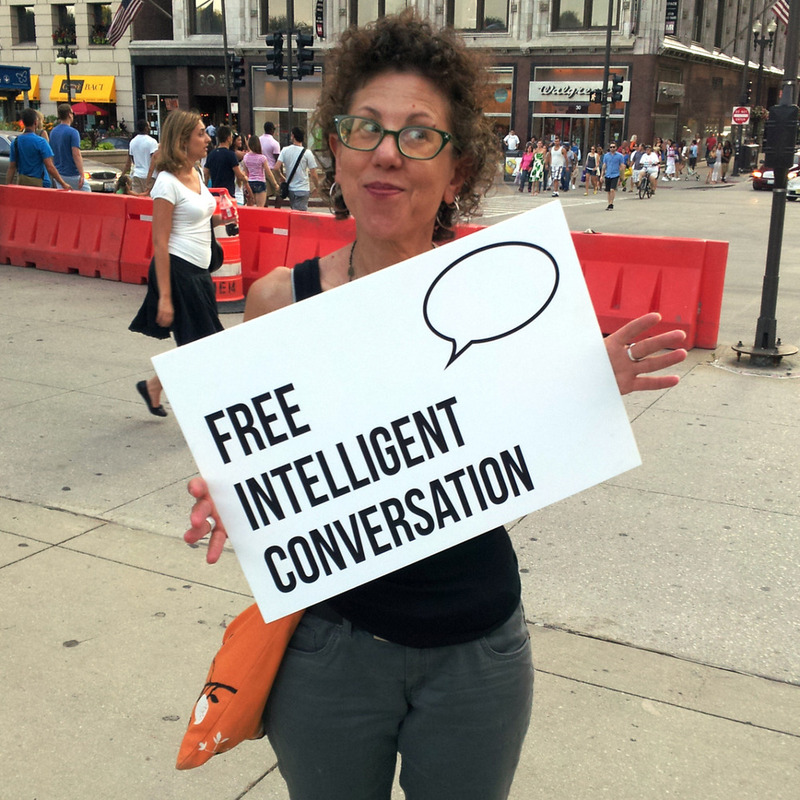 We hold up signs that read “Free Intelligent Conversation,” inviting people to talk to us about anything and everything. We want to meet people and learn from them through meaningful face-to-face conversations. We believe that by continually seeking to learn from others we can improve ourselves, break down social barriers, and make the world a better place. If you want to learn more about our mission, you can read the Free Intelligent Conversation Manifesto. For a brief summary, check out our objectives below. We believe our our differences should be distinctive, not divisive. Our differences provide an opportunity to learn from one another and we believe that is reason enough to seek each other out. We believe the best way to learn from each other is to engage in intelligent conversation. An intelligent conversation is one where we gain knowledge from whom we are speaking with. We create places where we seek out, learn from, and celebrate each other’s differences through intelligent conversations. Create places where you can talk about anything. The exchange and evaluation of ideas is our greatest mechanism for individual and collective development. For this to happen, we need a place where we can talk about anything. We create places where no topic is taboo and where people can speak freely without the fear of harsh judgment. We create places where strangers can meet, talk, and have public opportunities for positive interactions. We believe that by making conversation with strangers more accessible we can positively transform both individuals and the communities, cities, and countries that they live in. The people we know provide a sense of intimacy and connection, but it’s important to remember that strangers can also contribute to our sense of belonging. Even though momentary, a quick hello, or a nod of acknowledgement can make us feel less isolated. We are creating face-to-face conversations as a counter-cultural response to social isolation. We are looking to be present with people and remove distractions to have focused, uninterrupted dialogue. We want to encourage people to engage in meaningful face-to-face conversations and we provide opportunities for them to happen. 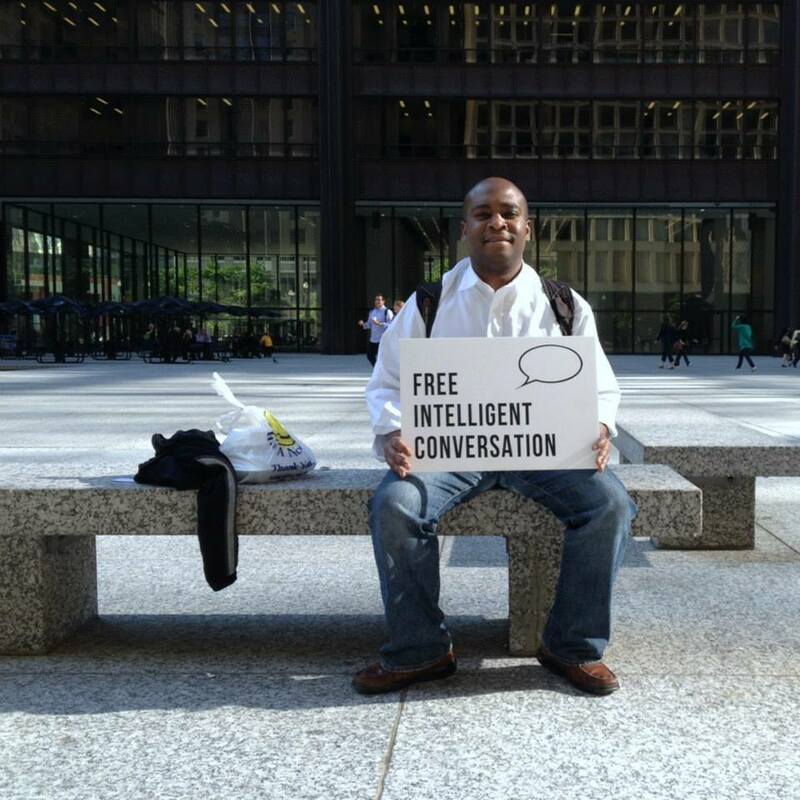 If you see us holding a sign that reads “Free Intelligent Conversation,” come talk to us. About what? About anything and everything. The only thing needed for an intelligent conversation is willing individuals. We’re willing. Check out FreeIC founder, Kyle Emile, deliver an exceptional TEDx Talk as to why we're all intelligent and why we need to talk to strangers more than ever—all while sharing the origin, growth, and vision of Free Intelligent Conversation.